Solariums, or glass enclosures, are a unique way to add additional living space to your home. 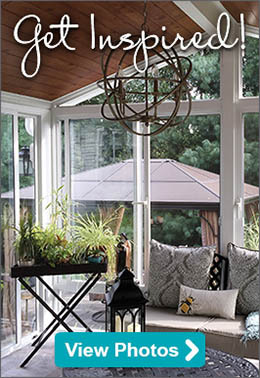 Made of energy-efficient 1" thick double-pane insulated glass, a custom solarium provides a ceiling to floor view of your outdoor surroundings. 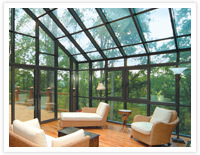 Solariums give you the most views than any other sunroom thanks to its glass roof. When designing a custom solarium to fit your home, lifestyle and budget, there are numerous options to consider including: eave style, room size, frame color, etc. Designing a solarium for your home should be a personal experience so you are sure to get exactly what you need and want. A straight eave glass solarium is ideal for projects that involve extreme height and roof pitch, Straight eave solariums are available with a single slope or gable roof and provide a sharp transition from the roof of your home to the front of the solarium. Patio Enclosures custom-manufactures and custom-builds every glass solarium to your exact specifications. This allows customers to specify the exact size room they are looking for. Based on years of experience, we will work with you to determine how best to size and design a solarium that meets your exact needs. There is bound to be some limitations in terms of existing architecture and foundation challenges, but we will do all we can to design the solarium of your dreams. The way you decide to use and decorate your solarium will be completely up to you. To provide some inspiration, take a look at the video below. It will offer an abundancy of solarium photos as well as some great decorating ideas to help you envision your own custom solarium.